Areas at risk include properties on Park Road, Buckley Road, Morley Street, Colley Street and Fox Street. The area bounded in blue on the map shows the area covered by flood alerts and warnings for Hey Brook at Rochdale, properties from Buckley Road to Fox Street. 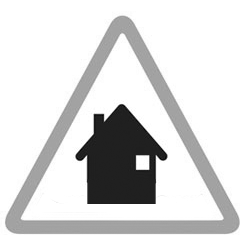 Areas at risk include properties at the north end of Park Road, All Saints Works, Heybrook School, and properties on Hector Ave.
Areas at risk include the area from Roch Valley Way to Yorkshire St and Albert Royds St. Including the Sewage works, Corporation Rd, Norman Rd, Bridgefield St, The Esplanade, South Parade, the Bus Station, Entwisle Rd and Belfield Rd. Areas at risk include those from Stubley Mill Road to Carriage Drive. Including properties in the vicinity of Todmorden Rd, Calderbrook Road, the cricket ground, Church St and adjacent roads and Canal Street.